Mario Cuomo Gave Some Great Speeches. But What Did He Actually Accomplish? And why are progressives so easily seduced by words? 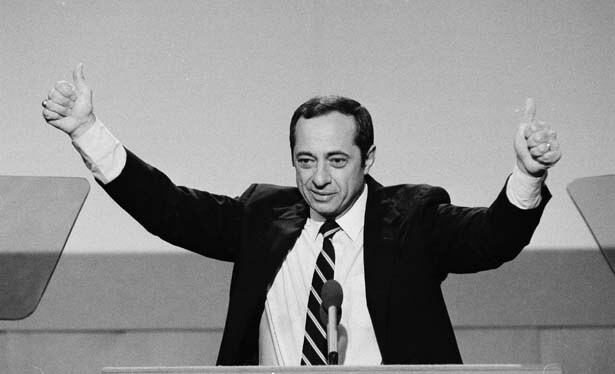 Mario Cuomo, who died on New Year’s Day, gave a great speech at the 1984 Democratic convention—perhaps, as some claim, one of the greatest speeches in American history. Directly addressing Ronald Reagan’s sunny depictions of morning in America, he thundered: “There is despair, Mr. President, in the faces you don’t see, in the places you don’t visit in your shining city…. This nation is more a ‘Tale of Two Cities’ than it is just a ‘Shining City on a Hill.’” If you want to know how far to the right we’ve moved since 1984, just compare Cuomo’s broad, magnanimous agenda—in which he attacked Reagan’s support for nun-murdering Latin American regimes and the bloated military budget and decried, at considerable length, persistent poverty without ever blaming it on poor people themselves—with the pinched technocratic programs of Clinton and Obama. Cuomo championed civil rights, human rights, unions and the values of solidarity, “the sharing of benefits and burdens for the good of all.” And he did this with gusto in what he must have known was a losing cause: this was the convention which nominated Walter Mondale, who went on to lose every state but Minnesota (and the District of Columbia) to the happy-talking reactionary in the White House. That wasn’t Cuomo’s only terrific speech. That same year, at Notre Dame, he explained why as a Catholic who thought abortion was wrong, he was nonetheless pro-choice as a politician, and why the separation of church and state was important for believers as well as nonbelievers. No wonder the obituaries of Cuomo have leaned heavily on his silver tongue, his intellect, his engagement with ideas, his moral convictions—particularly his courageous stance against the death penalty. Indeed, his stances and words were why The New York Times’s front-page obit hailed him as an “eloquent liberal beacon.” (Hmmm, is a beacon eloquent? Isn’t it more bright or shining?) My colleague John Nichols notes that Cuomo “came to be understood more as a statesman than a politician” and pairs him with Ted Kennedy as a “liberal lion.” As with those phrases, which connote past glory (no one calls you a “statesman” if you’re winning, and lions are always a bit past their prime), there was a nostalgic feeling to the praise: Mario Cuomo as the Galahad of a now-faded liberalism. I don’t want to take anything away from Cuomo’s oratory. It was indeed stirring and persuasive—so persuasive that you wonder why it didn’t, well, persuade. Is the Catholic Church less likely than thirty years ago to use the state to impose its dogma on everyone? Are voters calling for more social solidarity—or more social Darwinism? Is the Democratic Party more like Mario Cuomo or more like his Machiavellian son Andrew, friend of the 1 percent? Opposition to the death penalty is one of the few convictions Cuomo championed that have become more mainstream over time. All honor to him for whatever part he played in changing hearts and minds on that, but the man was elected to run a state, not a pulpit. Reading the eulogies, I wonder if liberals, leftists and progressives place too much value on noble positions and winged words, and not enough on deeds. Cuomo did some excellent things in his three terms as governor: he closed the Shoreham nuclear plant, improved children’s healthcare and nominated many progressive judges—including the first black man and the first two women (one of whom was also the first Hispanic) to serve full terms on the New York Court of Appeals. But the thing that had the most lasting impact merits only a passing mention in the encomia flooding the media: he constructed a vast array of new prisons to house the victims of the harsh Rockefeller drug laws. As Eric Schlosser wrote in a 1998 cover story for The Atlantic, although Cuomo himself opposed these laws, he added more beds to the prison system than all previous governors combined. Moreover, because the voters rejected a $500 million bond issue for prison construction in 1981, Cuomo took the needed funds from the Urban Development Corporation, an agency created to build public housing for the poor. By the end of his time in office, he’d spent $7 billion—a fantastic sum—even as the proportion of violent prisoners declined. The cherry on top: the GOP “controlled the state senate, and prison construction became part of the political give and take with the Cuomo administration,” Schlosser wrote. “Of the twenty-nine correctional facilities authorized during the Cuomo years, twenty-eight were built in upstate districts represented by Republican senators.” Thus, a population composed largely of men of color from downstate were confined in prisons far from their families—even though family ties help with rehabilitation, and the arduous travel required to visit loved ones was (and is) an expensive and exhausting burden on relatives. The prison complex also boosted the GOP’s political power: until 2010, the state counted inmates as residents of the town in which their prison was located, not by their home address—very useful for gerrymandering and for accessing federal largesse. I don’t know the answer to my question. Is everyday politics too boring and complicated? Is politics at bottom a form of theater (Mario Cuomo, after all, was dubbed the “Hamlet on the Hudson” for his lengthy back-and-forth about a presidential run). It’s almost as if we’re resigned to losing and think that words—the old, familiar words, the doomed roar of a noble lion—are the best that we can get.